Most people I've spoken to about the Paralympics are tending to watch it on and off - a majority tuning into the highlights on Channel 4 each evening. I think it is a pattern no different to Olympics viewing habits or any other international sports tournament for that matter. It perhaps represents a shift with Paralympians moving towards parity with Olympians. Yet there is an argument the shift won't stop there. 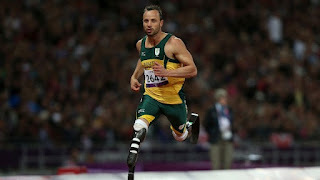 The focus of attention this week has tended to rest on Paralympic superstar Oscar Pistorius and his claims Alan Oliveira cheated (for which Oscar Pistorius later apologised, though only for the timing) by using prosthetics longer than what his legs would be if they were intact, thereby increasing stride length. I think though, before we go further, attention needs to be drawn to Alan Oliveira who had the limelight taken from what was a fantastic achievement in the T44/43 200m race - the BBC has published a good write-up on him. The controversy was arguably fuelled by a possible undercurrent of unease towards Oscar Pistorius for his desire to compete in the Olympics. This is allegedly coming from some Paralympians who quietly believe he views their tournament as second best and by Olympians who quietly fear the continued development of technology that has gained him access to their tournament - as Dominic Bastulto notes for the Washington Post, there is a possible shift towards viewing Paralympians as 'more than human' rather than 'less than human'. This is a great thing about the Paralympics, it challenges our perceptions from various angles. This particular issue also raises an interesting aside question, if a little more daydreamy and less practical than what I usually post on this site, about the development of technology to assist people with disabilities. And this does not necessarily need to be confined to the 'purity' of sports competitions, it could also eventually apply to the 'purity' of exams. The question is, at what point will technology move from having a therapeutic role to an enhancing role? For example, as the Ideas Bank blog of Wired Magazine geekily discussed this week, would you swap your biological eye for a bionic one with additional functionality? This is of course just futurology, but it got me thinking further - if there were a readily available pair of glasses that followed a student's eye movements and read aloud into their ear, would this address an inherent difference / difficulty such as dyslexia, or move the user's capacity to learn beyond that of peers? Ultimately though, it's a muse, a question we don't yet have the luxury of having to confront - because there's a long way to go yet, as Chris Bryant points out in his column for The Independent. On a more practical note, I've recently been exploring greater use of technology to support students in my setting, particular those with needs such as dyslexia, autism, hearing impairment and visual impairment. The technology section of the RNIB website has proved particularly informative. And there is some interesting observational commentary about the uses of iPad for children and teenagers with ASD scattered across the internet. This 'Free Ipad Apps for SEN' list from TES.co.uk is also well worth a look. I think that whilst education naturally has a long way to go with assistive technology, the Paralympics creates a healthy optimism that it can only get better and better. And as Steven Stanhope rightly highlights in his blog entry for the Washington Post, technology developed for 'special populations' tends to find use across the population (an argument I often use with SEN teaching strategies). This is another reason why we should celebrate the difference SEN and disability bring, rather than view them primarily as difficulties to be cured.